TGIF! The reality stars are having some fun on social media this week. 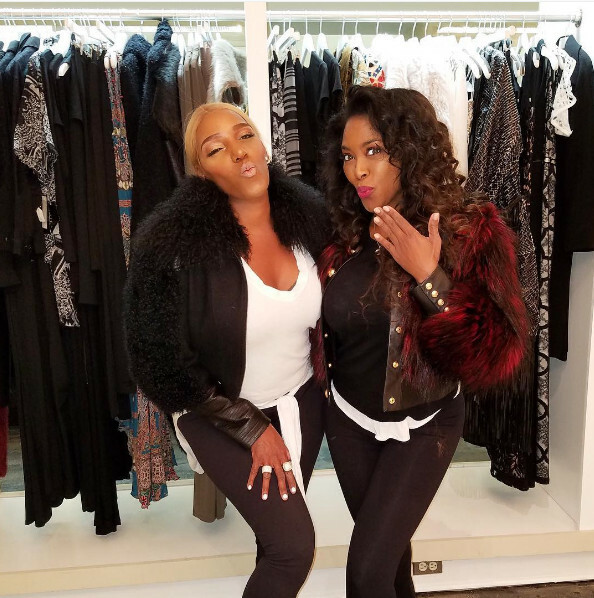 NeNe Leakes and Kenya Moore had a good time together at NeNe’s popup boutique while Kyle Richards headed off on vacation with Mauricio and Luis D. Ortiz was his typical ray-of-sunshine self. Check out the best of this week’s reality star social media snaps from Teresa Giudice, Farrah Abraham, Kylie Jenner and more. In this week’s edition of reality star sightings – we have the Little Women: LA cast attending RuPaul’s DragCon over the weekend. And interestingly, it looks like Christy McGinty and Terra Jole aren’t sworn enemies any longer. The two were seen chatting it up and not a single drink glass was thrown! Also attending the event: former co-star Brittney “Freakabritt” Guzman and current cast member Tonya Banks. Bethenny Frankel signed autographs for fans at the Kentucky Derby Day at Empire Casino in Yonkers, NY. Rachel Zoe, David Foster and more attend the Annual Goldie’s Love In For Kids event in L.A.
We have a bit of casting news for you regarding Season 4 of Little Women: LA, which kicks off on January 27th. Brittney Guzman, aka Freakabritt, has decided that one season of the hit reality show was enough for her! She shared in a press release last night that she has decided not to return for season 4. Brittney was a season 3 addition to the cast, along with newbie Jasmine Sorge. Brittney was an acquaintance of Terra Jole and had danced on Miley Cyrus’ last tour. She was quite a bit younger that the rest of the cast and was in a very different place in life than the rest of them, so I’m sure that had a little bit to do with her decision to pass on season 4. Let’s see how our favorite reality TV stars celebrated the holiday… some were nice, some were naughty, and some were their everyday famewhore selves that we love to snark on so very much. Below you’ll find pics from Bethenny Frankel, Kim Richards, LeAnn Rimes, Kylie Jenner, Chelsea Houska, Yolanda Foster, Porsha Williams, Fredrik Eklund, Katie Maloney, and more. In our latest roundup of reality TV star (past and present) photos we have for you: Caroline Stanbury, Melissa Gorga, Draya Michele, Lisa Vanderpump and so many more! Above: Lilly Ghalichi attends Trina’s Kid’s Foundation 2nd annual Runway Wonderland Holiday Charity event benefiting The Boys & Girls Clubs of America at Hubble Studio in L.A., along with former Shahs of Sunset star (although not appearing on the same season), Asifa Mirza. Real Housewives of Beverly Hills star Lisa Vanderpump rubbed elbows with Dynasty legend Joan Collins at the UKares event in L.A.
Melissa Gorga was spotted outside of her Envy by Melissa Gorga boutique this week. The Real Housewives of New Jersey star announced yesterday that her store is now open – just in time for Christmas shopping. , Brittney Guzman and so many others! Below you’ll find pics from Shannon Beador, Lilly Ghalichi, Porsha Williams, Ryan Serhant, Ramona Singer, Annabelle Neilson, Christy Gibel, Romain Zago, Coco Austin, Kenya Moore, Erika Jayne, and more. Exclusive Interview! Brittney “Freakabritt” Guzman Dishes on Little Women: LA, Terra Jole, and Her Reality TV Debut! Reveals That Kylie Jenner Is Rude! Brittney “Freakabritt” Guzman made her mark on this season’s Little Women: LA as one of the newest – and youngest – cast members. And she didn’t hold back when it came to confronting castmate Terra Jole. I got a chance to chat with Brittney yesterday about her reaction to the season, where she and Terra stand now, and what she’s been up to lately (spoiler alert: she met Kylie Jenner on Tyga’s video shoot recently and claims she was a total zero! ).